The Portola Valley, California, house Chevrolet chose as its base for the Bolt first drive event couldn't have been more appropriate. The family who lived there are the Joneses of sustainability. Construction of their green home was completed around the time they purchased the Bolt as their second car, offsetting the carbon footprint of their first, a Suburban. The affluent family is the ideal Bolt owner, but at no point during our experience behind the wheel of GM’s new EV did it feel like this was a car built exclusively for the 1%. On the contrary, the car did its best to appeal to buyers in all tax brackets. While the Bolt’s bulbous, polarizing shape makes it look small from the outside, inside it translates to a generous amount of headroom and full seating for five adults. In fact, the Bolt’s 94 cubic feet of passenger space matches that of a Tesla Model S, although it’s worth noting that the substantially larger Tesla has nine extra cubic feet of storage space (the Bolt offers 17 cubic feet). Half crossover half compact car, the Bolt pulls off the mass market jack-of-all-trades act with calculated perfection because, after all, it has to. Chevy gave vague responses to our questions about its target demographic, but as they say, the proof is in the pudding. A low-centered 3,580-pound curb weight and 60 kWh battery pack delivering 200 horsepower and 266 lb-ft of instant torque help the Bolt drive like a compact car, albeit one that has plenty of pep to set the pace in traffic. A run from 0-60 mph happens in only 6.5 seconds on the way to a 93 mph top speed. Getting in and starting the Bolt is akin to the experience Prius owners have, except that the gasoline engine never turns on. Our tester was the $41,780 Premier trim, the pricier of the two models available at launch. While the Bolt never comes off as a driver’s car (did you really expect it to?) the high-strength steel and various aluminum components felt solid, skewing towards comfort but delivering a crisp and responsive ride in the corners. Like all other electrically assisted units, steering is direct and uncommunicative. Chevy gives Bolt drivers the option to turn regenerative braking on or off to help first timers ease into the practice of one-pedal driving. A downward click of the shifter engages regenerative braking, which can bring the Bolt to a complete stop while recouping energy. It takes time to get used to, but we suspect that owners who attain full proficiency will never want to go back. 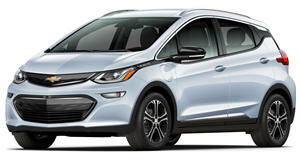 Unlike other mass-market EVs, the Bolt is meant to get from A to B and then some with an EPA rated 238 miles of range. On the road the Bolt is versatile and never feels like it's on crutches trying to keep up with real cars. Finding a comfortable seating position was a bit difficult due to a high perch and GM’s shift-by-wire Electric Precision Shifter was annoying as it always returned to center. Those annoyances aside, our Bolt was loaded down with safety features and driver's aids. Among those included in the Premier trim are automatic high beams, a 360-degree camera for the parking lot, lane keep assist, forward collision alert, rear cross traffic alert, and even a rear camera mirror (standard on the LT trim as well), which converts the rear view mirror into a screen displaying a wide view of what’s behind the Bolt. This is useful in the event that cargo or backseat passengers obscure the rear view of the driver. The center of attention is of course the massive 10.2-inch display screen that complements the driver’s 8-inch digital gauge cluster. Its layout is unique to the Bolt, looks like Windows 10, and can be personalized to display time, electric range, media playback, and eco driving tips as well as a concise report card of your driving proficiency. Interestingly enough, despite the fact that onboard Wi-Fi is standard, navigation is optional, although the Bolt does feature Android Auto and Apple CarPlay standard. [Editor's note: Chevy decided to forgo nav in the Bolt as it anticipates a greater use of smartphone-based navigation system use.] When prodded, Chevy wisely stated that some Bolt customers were trading in hybrids, not Teslas. That doesn't mean the Model 3 is safe. During a photo op, a jogger asked if our car was a Bolt. We nodded in the affirmative and he began taking his own pictures, telling he had friends who ordered the Bolt out of impatience over the Model 3's delivery date. While we’re unsure whether the Bolt can remain competitive with the Model 3 given its $37,495 starting price (which will dip under $30,000 as long as Trump doesn't do away with the $7,500 federal tax credit), it does represent the first practical electric vehicle for the masses. It’s a marvelous one at that, combining utility and most importantly, range beyond what normal urban and suburban drivers need, with all that contained in the footprint similar to that of a BMW i3. Chevy’s main accomplishment is that the Bolt can be scrutinized through the lens we use on an everyday passenger car, marking one of the first times a mass-market EV seems to offer all of the benefits of battery power with none of its downsides thanks to its 238 mile range. These do exist, and though our hour-long soiree with the Bolt wasn’t enough to reveal them, the fact that GM’s fast-charge network is nowhere near that of Tesla’s Supercharger network is enough to indicate that more needs to be done. Still, this is GM and if the auto giant wills electricity to power all its cars, it could have a superior network up in no time. That would really even the playing field, and give GM a massive advantage or its rivals in Detroit and abroad.